The country covers 241,590 sq.km of the land area, which is about the same size as Germany. The British flag is officially called the Union Flag, unofficially is known as the Union Jack. It is the combination of the crosses of the patron saints of England, Ireland and Scotland and has existed in its present form since 1801. Wales is not represented because when the flag first appeared it was already united with England. The red cross in the white field is St George 's, the patron of England. The white cross in the blue field is St Patric's, the patron of Ireland. The red cross in the white field is St Andrew's, the patron of Scotland. The national crest is the coat of arms of the royal family. The shield in the centre shows the emblems of the parts of Britain- the 3 lions of England in 2 of the quarters, the lion of Scotland in the top-right quarter and the harp of Ireland in the bottom-left quarter. The motto around the emblems "Honi soit qui mal y pense" means "Evil to him who evil thinks". 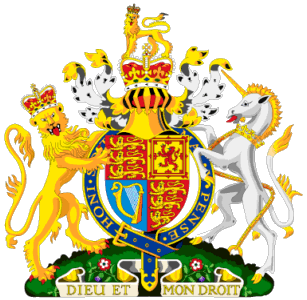 The shield is supported by the english lion and the Scottish unicorn. The plants under the shield are the rose of England, the shamrock of ireland and the thistle of Scotland. The Sovereign's motto "Dieu et mon droit" appears in the very bottom and means "God and my right". United Kingdom of Great Britain and Nothern Ireland is located in Western Europe, only 35 km from France 9now linked by a tunnel under the english Channel). The Uk is part of the British Isles, which is a geographical term for the group of islands between the North Atlantic Ocean and the North Sea. The largest of the islands is Great Britain ( the mainlands of England, wales, Scotland). The next largest comprises Nothern Ireland, which is about one-sixth of the island of Ireland, and the Irish Republic. The Isle of wight and the Isles of Scilly, Anglesey, Hebrides, Orkney and Shetland have administrative ties with the mainland. However, the Isle of Man in the Irish Sea and the Channel Islands between Great Britain and France are self-governing and are not part of керу United Kingdom. The seas surrounding the British Isles are shallow, usually less than 90 m deep. This fact is very impotant for fishing because shallow waters provide breeding grounds for a lot of fish. The climate is temperate and humid. It is moderated by prevailing southwest winds over the North Atlantic Current. more than half of the days is cloudy. The temperature is rarely above 32 º С in summer and below -10 º С in winter. In spring the days can be very changeble, from warm sun to brisk breezes and showers. Most summer days are pleasantly warm. Autumn is one of the best seasons. Although the nights begin to get a little chillier, september is often like a summer month. Winter brings the coldest weather, but winters are not severe. все самое важное и нужное в кратком изложении!